Welcome to Bluegrace Portuguese Water Dogs. This is an ancient breed of historical significance. As an owner you have a responsibility for the future of this breed. Do you think you can do it? Challenge accepted! Yes, we have puppies now, available to go shortly. Please read on so you can get all the info and instructions for how to contact us and what information you need to provide. Remember, this breed is not for everyone. It’s active. Very active! And smart. Quick note before we go any further: We only recommend positive reinforcement training to be used with our puppies. There is to be absolutely no “submission training”, no forcing a puppy to the ground for 30 mins to be growled at when it moves. We are horrified to discover that anyone could ever recommend such a process. I am sure you are smart enough to work out why this is such an abhorrent method which was wrong when it was first suggested in a backwater many years ago, and is still wrong today. Forcing a dog to submit will neither fix aggression issues or fear issues and is more than likely to make them a lot worse. It will take you about 5 nano seconds to find on the internet wonderful free resources to help train your dog in a positive and responsible manner, and feel free to ask me for help. Check what training protocols any breeder of any breed recommends in the early stages before you commit to purchasing a puppy. Based north of Melbourne, Australia, we have been involved in this breed since 1997. There are a number of pages to explore here, and for those of you interested in getting involved with the breed, we are enthusiasts happy to meet with you, share our knowledge, and show you our dogs. And if you do visit, if you’ve been able to read through all or most of this website, that will give us a big step up on our discussions. 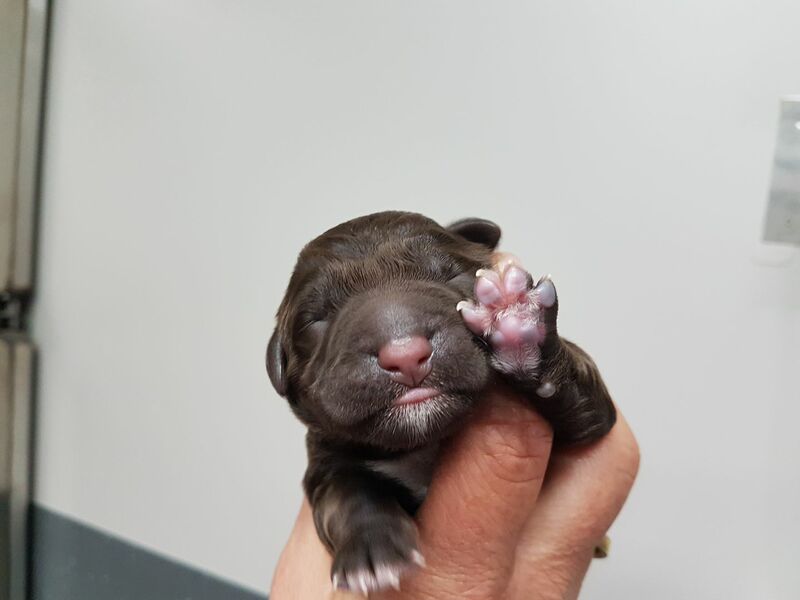 Our latest litter of pups has been born. These are all black, with perhaps a smidge of white. Please see pic below. The price for the pups are $2800 each. These will be ready to go end of April 2019. These will all be black with a little bit of white, and will be either wavy or curly. You’ll be taking advantage of our extensive experience in the breed to determine what is going to best suit you over the long term, not just the one “with cute white feet” because that will impress your friends (Pro tip: white bits knot/matt a whole lot easier and always show the dirt – so you’d better be ready for a whole lot more grooming). And there will be no selection of puppies based on someone sitting down amongst pups and waiting for the pup to “choose them”. I am quite disturbed that not only do people think this is a correct way to select a puppy, but that breeders allow this. Both our litters earlier from last year were fully reserved before they were born. Say hi to this cute little guy. 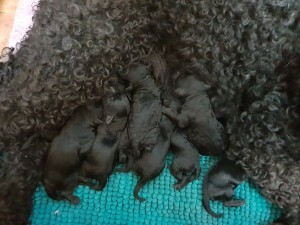 This was taken about 20 mins after he was born, who went to a home with another of our Portuguese Water Dogs. He’s fantastic and a real water baby. I would highly recommend you touch base shortly so that we can work together to see if I am the right breeder for you and if I think you can handle this very energetic and messy breed. Our pups are $2800. We do not release the pups until 12 weeks of age, and that price includes both the C3 and C5 vaccination at the appropriate time, chips, and desexing. Our pups are not available undesexed unless you are intending to show the dog or are running it on for me as a potential breeding dog (which is really rare). 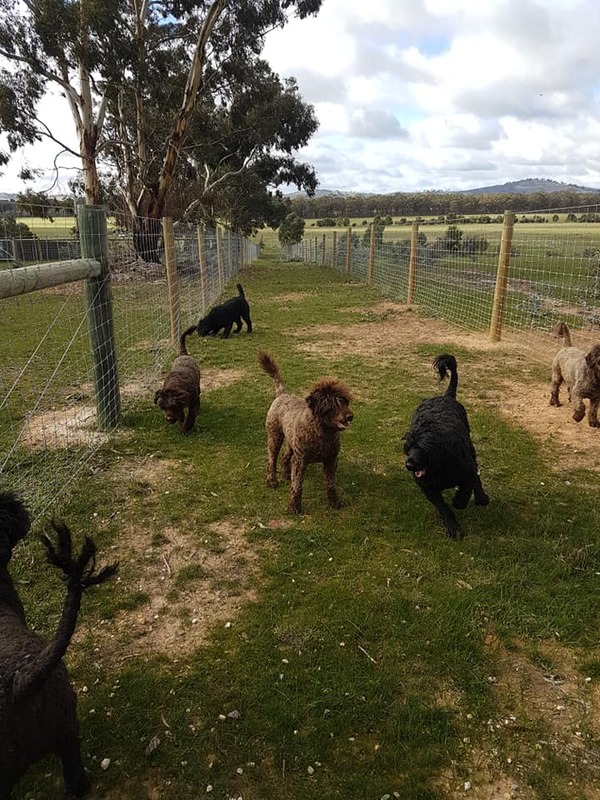 They will be very energetic & messy working dogs, suitable for people who can and will dedicate the time to training who want an amazing dog, and who know that you get this by doing a lot of work, rather than a magic wand. Email me at: jane@bluegrace.com letting me know a bit about you and we can go from there. There are no right or wrong answers. Ok, yes there are. Sometimes people call me and tell me they have thoroughly read through the site and researched the breed, and then answer those questions above in a way that I think there’s a difference between reading this website and taking the information on board. My quest is to ensure as much as possible that you will be a good fit for this breed. That you will put the time and energy into it. That this is not just a pup that will be dumped in the back yard once you’re sick of it. That you will put in the training. That you can cope with the energy. That you will not dump the dog for someone else to sort out because you haven’t put the required amount of work in early. 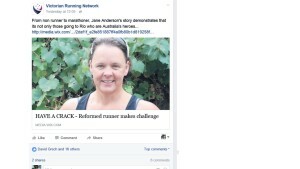 Feel free to call me on 0412 113824 to discuss on week days (feel free to join me on weekends if you’d like to help me with ironman training) if one of these enthusiastic, zest of life characters are the right dog for you. We welcome you visiting our location and meeting all our dogs and seeing the Portuguese Water Dog in working action. having a new pup is like having a new child. Do you have the time & the inclination for training? are you prepared to pinky-swear that you and your partner will do all the necessary training, and your kids (if you have any) will not be expected to be responsible for the dog? if you don’t put in the training in the first 6 months, there is little you can do later to correct the situation. Your breeder nor any trainer does not have a magic wand to fix your dog’s lack of training and subsequent poor behaviours. And it will cost you thousands of dollars and endless hours work later on if your dog has developed a range of inappropriate behaviours. just because now isn’t the right time, doesn’t mean that 2-3 years down the track might not be a good time. Just wait until things are more settled in your life, so that you don’t over-commit yourself. Today’s training tip: Regardless of the breed of dog, the earlier you start training your puppy, the easier it is. Conversely, the longer you leave it to start training, the harder, longer, and more expensive it is to get results. And sometimes you can’t change those bad behaviours you’ve unfortunately let develop. And there is no magic wand to fix a dog’s bad behaviours. Our new stud dog from Europe has arrived has now completed his health testing with his hips & elbows being great, and having passed his other required genetic testing. Both of our other stud dogs have similar excellent results in both hip/elbows and available genetic tests. All dogs have been in the show ring, with some attaining multiple championships, whilst others continue in their quest to achieve theirs. All our girls have been shown in the show ring and we are very choosy about who stays in our breeding program. 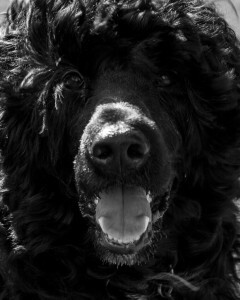 The Portuguese Water Dog is: intelligent, non-shedding, hypo-allergenic, and medium sized working dog…. just like a life partner should be. The Portuguese Water Dog was used as a working dog with the Portuguese fisherman, where it took out nets, carried messages between boats, picked up items accidentally dropped overboard, and protected the catch and the boats. As such, it is a true working dog, which can fit in well to many situations – as long as the work is put in early by the owners to have a well behaved and managed dog. They do required twice daily exercise sessions for their entire life. What a wonderful way to help keep both dog and human in shape! Our dogs are involved in conformation showing, obedience, agility, school visits, endurance tests, herding, and flyball, and make wonderful companions to homes that can meet their exercise and discipline needs. Please note, because of superior behavioural outcomes, we now only let our puppies go at 12 weeks of age. Those extra 4 weeks at home particularly developing appropriate behaviours make all the difference. Call us on 03 5433 6259 or 0412 113 824 for more information. 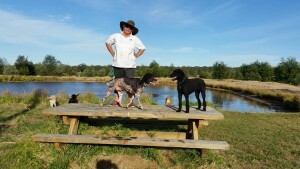 We invite you to visit our home, just north of Melbourne, where you can see our comprehensive program for our water dogs, and meet the puppies that we currently have available for the right homes.Please note, the Portuguese Water Dog needs a home where there are exercise opportunities both morning and night, where an adult in the household is responsible for the dog, and where the adult can attend dog training for at least the first year of the pup’s life.We have developed extensive literature, training material, and advice with an excellent support network to help you grow your pup into a wonderful adult dog. Time and dedication is needed to help create the best water dog for your situation.Yes we have puppies available, but we want people to take their time in making a decision to ensure that not only is this the right breed for them, but also, critically, that I am the right breeder for you. Having trouble getting on your raw diet email list, for helpful information. Please put me on your emailing’s. I am a proud owner of a Maremma. She likes Raw meat and Bones. I am contacting you from Croatia. My family decided to have a dog. We are very interested in Portuguese Water Dog. Can you please advise when do you expect to have new puppies and what would be their prices? Hi Kristina, thanks for your enquiry. There are many lovely Portuguese Water Dogs in different parts of Europe. You might want to try closer to home first as it is very expensive to ship a dog from Australia. great! that’s close by. I’ll email you! 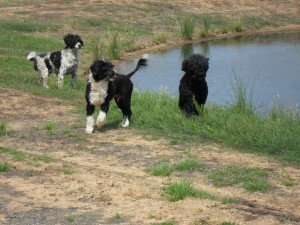 I am interested in a Portuguese Water Dog and have done a deal of research. We live on the water and are a very active family. Our home has a small but reasonable yard but lots of walking areas and beach around our place. We would be looking at around August to have a puppy. We are willing to put time into training as our dog would need to be well trained in the many leash free areas we would go to. We are at work 7-8 hours a day four days a week but the dog would have access to the whole house and yard during that time. The other day, we intend to take the dog to doggie day care for socialisation. We are in far north Queensland but could consider coming to Victoria to meet with you. Could you let me know about cost. I’m massively excited to find your website. I’m very ready for a dog and everything I’ve read about the Portuguese Water Dog Breed makes me think we’re right for each other. Great to hear you have pups on the way. If you happen to have the arrival of a brown and white one, we could be really good pals. Id love to come visit you and learn more in person. 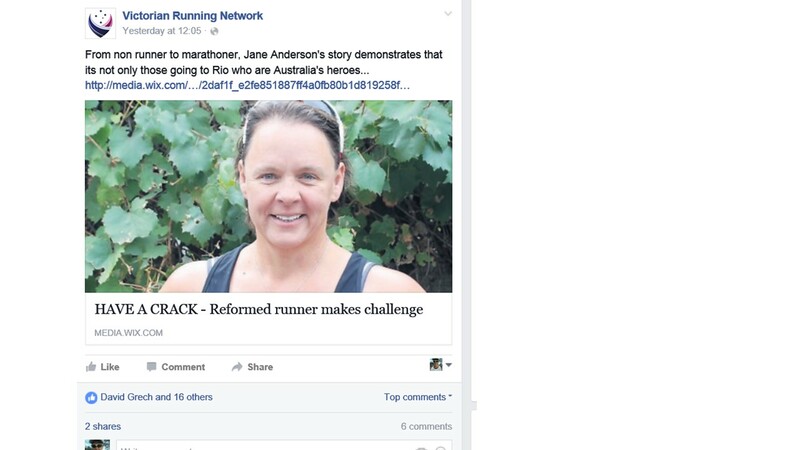 Jane…I ran across your site …not sure how I got here, but very glad I did! I just wanted to say thank you for all of your thoughts and advice. Although I am based in the USA, I am taking your advice to heart and practice. I will be looking for a breeder closer to home, but if you happen to have any leads (folks you may have networked with and respect), I would very much appreciate that. Thank you again and continued great work! I will be reading for sure!